Sean Dyche believes Burnley’s mental fortitude will come to the fore as they prepare to face Everton in the Premier League on Sunday. 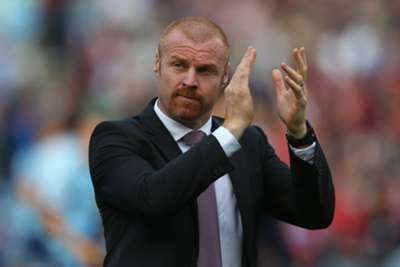 Burnley defied most people’s expectations by gaining promotion from the Championship in Dyche’s first full season in charge, but they have struggled in their new surroundings. Dyche’s men remain the only club in the division yet to win a game this season, and have four points and just four goals to their name after eight matches. Although Sunday’s visit of Everton hardly represents a straightforward opportunity to end their winless run, Dyche is confident the mentality garnered in the previous campaign will see Burnley through. “It’s a different challenge, it’s unfamiliar territory to most of the players and myself, but there is a growth in performances,” he told the Burnley Express. “We built this mentality of being relentless, going hard every game, and although that can’t guarantee an outcome, it gives you a better chance of winning games. “It’s easy to talk about the mentality when you are winning games, but it’s a different challenge when you are not. Everton earned just their second league win of the campaign last time out with a 3-0 home success against Aston Villa, but have had the added complication of a trip to Lille on Thursday in the UEFA Europa League. Roberto Martinez’s men came away from France with a creditable 0-0 draw, having kept a second successive clean sheet following defensive problems earlier in the season. Everton have lost each of their two league games that have followed Europa League fixtures this term, and Martinez has warned against any complacency if they are to avoid continuing that trend. “It’s a huge challenge,” said the Spaniard. “I saw them [Burnley] play lots last season and they are a really strong unit. The start that they had has already given them very good experience and I know it’s going to be tough to face them on Sunday. Martinez revealed on Friday that he has no new injury worries, with long-term absentees Kevin Mirallas (hamstring) and John Stones (ankle) still unavailable, but expects Sunday’s match to come too soon for Bryan Oviedo (leg) and Arouna Kone (knee). Burnley will make a late decision on midfielder Dean Marney (hamstring), while the trio of Matt Taylor (Achilles), Sam Vokes (knee) and Steven Reid (groin) are still out.